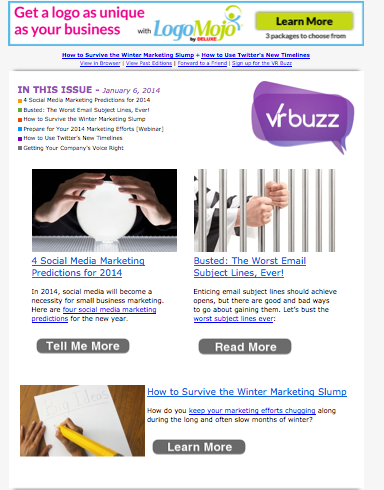 As your business evolves and changes, your email newsletter should follow suit. The subscribers who are currently signed up for your list may have different needs, values and backgrounds than the people you were writing for when you first launched your newsletter. The template that was once on-trend might now be painfully outdated. If you want to keep your readers engaged, you have to continually examine the state of your newsletter — evaluating everything from design to open and clickthrough rates. And there’s no better time to do this than the start of the new year. To identify your audience, review the previous year’s newsletter metrics and all of the information that you’ve gathered about your active subscribers (that is, contacts who have been opening and engaging with your messages). Where do they live? How old are they? What is there marital status? Which industries do they work in? The answers to these questions may surprise you. If you don’t already collect this kind of demographic data when people sign up for your list, consider sending out a survey to learn more about your readers. Once you have a complete picture of who you readers are, you can make educated guesses about what will resonate with them and begin to tailor your content to match their interests or needs. For instance, discovering that the majority of your audience is over 50 years old could influence everything from the language you use to the kinds of tips you offer. The more you target and home in on your audience, the more you’ll understand what they want out of a newsletter. You should be tracking and reviewing your newsletter’s performance all year long to make sure that you’re meeting your marketing goals. But as you gear up for a new year and start developing your strategy, it’s especially important to take stock of the newsletter’s overall performance, noting any trends, wins or setbacks. Remember, though, that there’s more to newsletter analytics than the number of opens and clicks you receive. Taking time to dig deeper into your readers’ behavior will open your world to a plethora of knowledge about their reading habits and desires. The knowledge you obtain should be used to shape and optimize your newsletter. So what should you pay attention to, specifically, in your newsletter? Content trends: What content resonates with your readers, and what topics are the most popular? Look for patterns. Are readers clicking on tutorials, guides, videos, blog posts, promotions, updates, events or recipes more often? Are posts about, say, face wash products more popular than hair care? Do people click on “do’s and don’ts” posts more often than “how-to’s”? If blog posts about dog grooming are booming, put them at the top of your newsletter. If your upcoming events are stealing the clickthrough show, include them more often and near the top of your newsletter. Are people going click-crazy on your social media icons or pages? Move them up or make them more prominent. Use this information to guide the direction of your content for each newsletter going forward. Location of clicks: Are your customers clicking on any of the content, buttons or links that require scrolling to get to? If not, your newsletter is not maximizing the user experience. Consider including a table of contents at the top of your newsletter to help guide customers all the way from top to bottom. Use the pre-header as a secondary subject line and talk about the content down below. Are your readers only clicking on headlines? They may be strapped for time, or simply want to get to the source. Email Analytics tools that offer Advanced Reporting can tell you where readers are clicking. Use this particular information to make it easier for them to get to the content they want. Once you get a feel for your readers’ behaviors and trends, use this to your advantage and refresh your newsletter design. Is your logo at the top large and pushing valuable content down? Make it smaller. Do your customers click on text links? Include clickable headlines, make them big(ger) or more prominent. Are your article sections lengthy? Make them smaller and use a template with no more than two columns per design to improve mobile viewing. Are text links not getting much love? Try including call to action buttons to each section instead, or in addition. You should also keep your eye on what other companies are doing. Look in your own inbox and take note of what design elements work and are the most appealing to you. Design best practices are changing all of the time, and a template that you chose five years ago is likely to seem outdated to your current subscribers. Here’s an example of how we updated our newsletter, VR Buzz, from 2014 to 2017. We divided the layout into easy-to-read content blocks, added more color to make each block of text and our CTAs stand out, and removed a table of contents that might distract from our CTAs. BONUS! Segment your lists: Segment your newsletter lists and watch your most engaged readers’ content consumption closely. Create an “Engaged” list of people who regularly open and click your newsletters. When you segment your list this way, you’ll be able to customize content and continue to create newsletters that resonate with this audience. The start of a new year is the perfect time to take a close look at your newsletter and its performance and determine how you can better serve your audience. So begin your refresh now, and ensure readers are receiving the best newsletter out there.